But Pylon II, a new work by Coleman Pester under Tectonic Marrow Society (TMS), takes that theme a step further in creating less a dance and more a dystopia where surveillance and oppressive structures rule the land. The work was presented by 9e2 Seattle, a 9-evening festival at King Street Station that teamed up artists with scientists and engineers “in a spirit of experimentation.” The festival included performances, installations, exhibits, and discussions. Many things were notable about Pylon II. 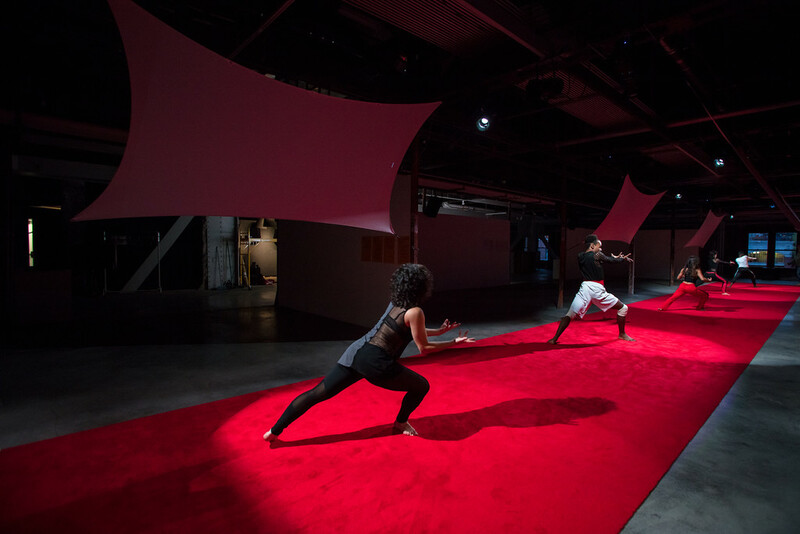 The first is the stellar dancers—Randy Ford, Cheryl Delostrinos, Lorraine Lau, David Rue, and Jenna Eady—all of whom are artists of color. Second, the electrifying sound design by Monica Khot. Last but not least, the intelligent collaboration between Pester, programmer Ari Chivukula, and multimedia artist Alex Boeschenstein in creating the video projections that included everything from the blueprint of King Street Station, overhead footage of the dancers’ performance, to profile pictures of people who RSVP’ed to the event on Facebook (how’s that for surveillance?). The dancers embodied Pester’s cleverly physical and textural choreography—seamlessly weaving between robotic sharpness and primal fluidity. Ford, in a red mask, opened the show strutting across the red-carpeted runway stage, intermittently posing and slinking to the floor, his energy electric. The rest of the cast crawled in soon after, all wearing masks except for Eady. The masked figures slithered around her, maneuvering and supporting her simultaneously. Remnants of Ford’s energy faltered, replaced by simmering tension. From here on out, the group went on survival mode, as though each for their own. Duets focused on manipulating and resisting manipulation, and even solos had to do with withstanding control by an unseen force. In one duet (sans red mask), Ford wielded a white ball and Lau mirrored its movement, as though Ford commanded her with it. The tension was unmistakable. Another coupling, Eady and Rue, took turns snatching the red mask off each other; each dominating the other with intricate lifts and dynamic sequences. Dancer David Rue. Photo by Joseph Lambert. 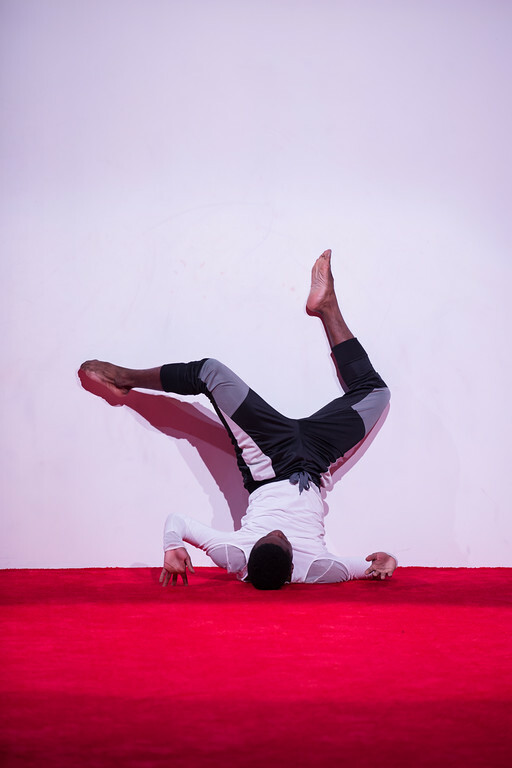 While these and other groupings showed the performers’ ability to connect, even without physical touch at times, there existed an evident theme of trying to escape the constraints of the group. Images of androids come to mind, only here they are trying to rediscover their humanity after it has been taken away. Still, genuine human moments of curiosity did emerge among the performers, whether in each other or in discovering their surroundings (Rue even walked around examining the surveillance cameras; this footage was later projected onto the screens along the stage). It never became clear what was controlling these sequences, or what was at stake when these characters were pitted against each other. At the end, the performers each repeatedly executed a fiercely vigorous phrase while regularly swapping locations. Though interminably long, the almost machine-like repetition made what came after a welcome relief: they ran across the runway, and playfully chased each other from pole to pole along the side of the stage, sometimes smiling. Freedom at last. If only it came sooner. In the program, Pester notes the recurring theme within TMS’ Pylon series: systematic fear and control placed on human bodies operating within modern society. 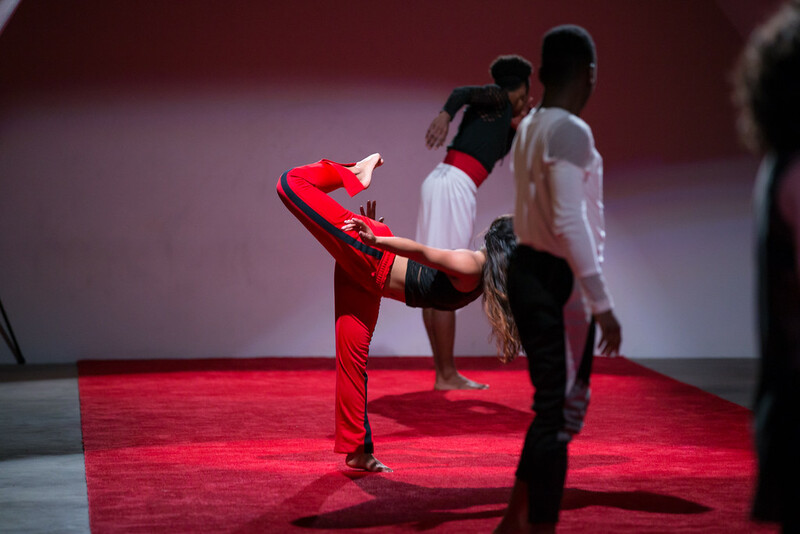 The dance, music, and the performers’ relationships, all contributed to this world of crafted fear, forced order, and desire to break away from that order. Pester created a clear arc and finely tuned world. Given the context of the 9e2 series, Pylon II proved an exceptional marriage of dance arts and technology. But whether Pester sought to provide a comment on this crafted dystopia, or presenting this oppressive world was the insight in and of itself, also never became clear. The work asked questions just as much as it answered them. For one thing, what are the implications of having a cast of all people of color in a piece about oppression, in an industry where an all-people-of-color cast is not yet a normal occurrence? In the real world, where those of color (and others) are still attempting to survive these systems of power and control, is this staged world then just a regurgitation of those systems without any further analysis? Or is an adept depiction enough of a statement about oppression in modern society? There doesn’t seem to be one correct answer. If anything, Pylon II—with all its complexities and ambiguities—invites even further discussion on what it means to control and be controlled. Pylon II is part of 9e2 Seattle’s festival of arts and technology. The nine-evening festival ran from October 21 to 29 at King Street Station. More information on TMS can be found on its website, and more on the festival at 9e2seattle.org.